There is another major development in a case that has baffled police and the public for over a year, drawing worldwide attention to British Columbia's southwest coast. Another severed foot has washed up on B.C. 's shoreline, this time in the Vancouver suburb of Richmond, where it was discovered by a woman on Tuesday morning while she was walking near the banks of the Fraser River with her dogs. "It had been brought up by a high tide,'' said Diane Johnston. Since she was too scared to climb down the river bank to fetch a running shoe that was sitting up on a rock, she notifed her husband Ken, who later phoned Richmond police. RCMP Const. Annie Linteau has confirmed that the New Balance running shoe contained the remains of a human foot. "We can cofirm that this latest recovery is a NB [New Balance] shoe and it is a left shoe. We are certainly aware back in May, a right New Balance was located,'' said Linteau. That foot was found nearby on Kirkland Island. A sample of the Richmond discovery was sent to the B.C. Coroners office for further examination on Wednesday. It is the seventh foot to have been found in a coastal region -- that includes the B.C. west coast, and the northwestern tip of Washington State -- since August of 2007. The first foot was found on Jedidiah Island, in the strait that divides Vancouver Island from the mainland. It was a right foot inside a Campus-brand men's size 12 running shoe that was mainly distributed in India. Six days later, another right foot -- inside a man's size 12 Reebok running shoe -- washed ashore on Gabriola Island. A third -- a right foot in a Nike sneaker -- was found in the area on Feb. 8 on the east side of Valdez Island. The fourth and fifth feet were both found near the Fraser River. The fourth came ashore on Kirkland Island on May 22 and was the only one of the five that came from a woman's body. It was found in a New Balance running shoe. The fifth, a size 10 left foot, was located a kilometre away on June 16. It was later determined to be a match to the foot found months earlier on Valdez Island. 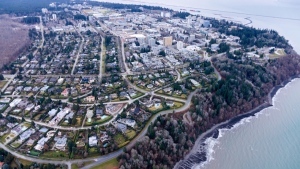 Then, on August 3, a newspaper in Washington State reported that a running shoe, containing bones and flesh had been found at a Strait of Juan de Fuca beach, just south of the U.S-Canada border, about 40 kilometres west of Port Angeles. DNA from the Richmond foot will be extracted and compared to 53 known missing people or human remains previously discovered. To date, 306 comparisons have been made. However, only one match has been made. That foot matched the DNA of a man who was depressed and likely took his own life. With reports by CTV British Columbia's Renu Bakshi and Jon Woodward. Diane and Ken Johnston discuss the latest possible development in the missing foot case. Nov. 11, 2008. Officers from RCMP 'E' Division display an image of one of the shoes found, during a press conference in Vancouver on Thursday, July 10, 2008.